Dudjom Lingpa (Tib. བདུད་འཇོམས་གླིང་པ་, Wyl. bdud 'joms gling pa) aka Chakong Tertön (Tib. ལྕགས་སྐོང་གཏེར་སྟོན, Wyl. lcags skong gter ston) (1835-1904) — a great Nyingma master and tertön whose revelations fill twenty volumes. 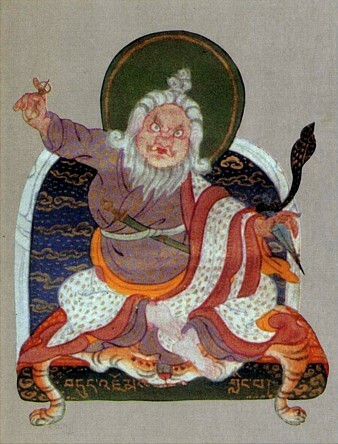 He was considered to be the emanation of Khye'u Chung Lotsawa, one of the twenty-five disciples of Guru Rinpoche. His immediate incarnation, born even before he himself passed away, was Dudjom Rinpoche. The Zabsang Khandro Nyingtik cycle (‘The Profound Doctrine of the heart Essence of the Dakinis’), which contains the Namchak Pudri Vajrakilaya practice. Tulku Pema Dorje (1867-1934), an incarnation of Dragyur Marpo Lotsawa. Khyentse Tulku Dzamling Wangyal (1868/9-1907), an incarnation of Do Khyentse Yeshe Dorje, father of Dzongter Kunzang Nyima. Apang Tertön (1895-1945) is also considered to have been miraculously conceived through Dudjom Lingpa's enlightened intent (Tib. དགོངས་པ་, Wyl. dgongs pa). ↑ Translated by Richard Barron (Junction City: Padma Publishing, 1994, revised edition 2002). ↑ According to Gyatrul Rinpoche. Holly Gayley, Who's Who in the Dudjom Lineage? This page was last edited on 24 November 2018, at 07:23.